You dream of a 异星海绵生命体之间流行的三操作界面四维棋 at home. 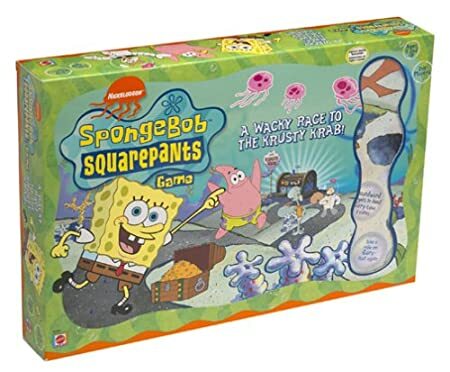 But for various reasons regarding production/reception/price/target consumers, what you can sell is a spongebob board game. Anyhow, "being popular" is always abstract: One thing got hot despite of all naysayers, and then 99999 things tried to copy that as if its a "formula". The 1/100000 do exist, but its much easier to go for 999999 that's all. >You switch powers by dying and getting a new body. See, public demands and design goals here were complete opposite. I could change it (and I did, just a teeny little bit) so its less random, or even overhaul it so that it plays like every other superpower games out there, but... That would make it just like every other superpower games out there. So, finished the system, sealed it, and moved on. Like I said, what you choose to do is personal. Trying to be more popular though... Requires compromise. Roleplaying games always have an element of control that is beyond regular life. A ) You completely spec your character attributes & abilities to every detail <-> You cannot do that (for now at least) and has to settle with mostly what you physically have when you are born. B ) You can custom your character's gears at an every increasing environmental limit <-> You always reach a certain limit in life one way or the other, whether that be physical, economical, cultural, lawful, etc. C ) You can largely do whatever you want with little repercussions <-> There are ALWAYS consequences in life, even for "good" things. Characters in fictions, like MacGuyvers who's pretty much the modern rouge trapster/artificer, or LN protagonists given "useless" powers and then used them to crush their intellectually-retardant bit-villains... You can do that with readers, but you cannot do that with Players. > You don't get whatever you want (Even though the standard 50 given powersets were already "OP" comparing to 80% of everything you'll ever meet. Seriously we're talking about absolute invincibility to the point of not having an HP stat, or ability to control direction of gravity, to complete invisibility to technology, etc.) But you'll always have something. > That "don't get but have" idea means you pretty much have to coordinate with your teammates to get the "optimal" outcome. (Blowing everything up is actually very simple with powers + infinite lives, except that you don't get to be a hero if you do that here, it being a covert ops setting where most goals involved getting things done without anyone knowing something's wrong.) Or even if every PC's abilities were mismatch, you could quickly change that... Or stick with it and think on your feet cause, again, infinite lives. > As you start with a blank background and use ingame mechanics to fill out character details at a step-by-step pace, - ie. You activate your Drama Points by answering questions about bits of your past lives, kinda like How 3:16 did it. - it was supposed to be character focused. A situation beyond me or my player's absolute grasp, with no guaranteed "conventionally certain" 1>2>3>4 step by step, where people have to overcome the situation with wit more so than stats and maybe showed a bit of their personal characters in between... That's the stories I wanted to read. And the position of a GM could be a pretty good front row seat, if all you wanted was to see a good show regardless of outcome, instead of trying to make all actors the puppet of your whims. So I made a game out of it. But I've long accepted the fact that "My Interesting Isn't Your Interesting." Speaking from quantities, as an Entertainment Product the mass will always be right on these issues. So its perfectly fine if nobody likes it. It is what I think of as "Cool", though not the only thing, and that more "typical" goals are just as "Cool" too. And like I said, its really not hard to change everything. Every new project after the previous is in a sense a "change" as that all based on the creators' previous experience. Most of my other stuffs are probably more conventional... Or so I hope. So, back to thread topic: "How many effort are you willing to go to get yourself popular?" PR & Brans are just methods & shortcuts. You still need to consider compromises after those stuffs are done. Other than that, I can only say, "Don't do what I do?"